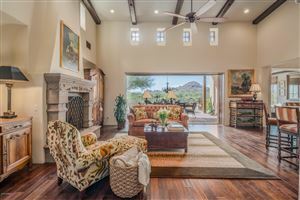 Hacienda style home on 3.6 acres. Privacy, views, outdoor living. 4 en-suite bedrooms, casita & coach house. 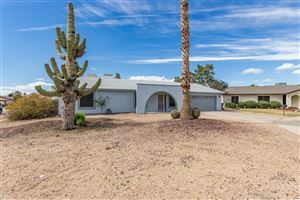 Remodeled inside w/extensive landscape & hardscape upgrades, featured in Phoenix Home & Garden. Remodeled chef's kitchen w/dual Wolf oven, griddle, FD Sub Zero fridge, custom cabinetry, tile, wood & zinc counters & large walk-in pantry. Kitchen opens to family, dining & entertainment area w/full bar, wine storage, custom bookshelves, hidden speakeasy & fireplace. Master suite w/separate seating,custom built-ins & work/office space. His & her vanities, water closet, large shower & walk-in closet. Laundry room w/storage just down the hall. Exterior seating & dining areas under roof allow outdoor living all year. Rooftop deck w/valley views South & West, & mountain views North & East. Data last updated 4/25/19 10:59 PM PDT.